“The Blacklist” is again becoming a show to remember, despite a forgetful first half to its second season. The first half of “The Blacklist” has been a little lackluster. Episodes came and went with not much happening and not much at stake for characters. I had almost given up on the show. Fortunately, it looks like those days are behind “The Blacklist.” Raymond or “Red” Reddington (James Spader) returns to his old tricks of manipulation and mystery. He helps the FBI when it benefits him and goes to his criminal companions when the legal method isn’t as convenient. 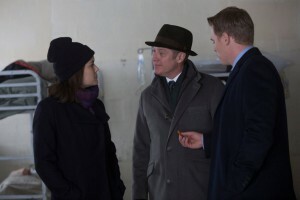 As always Agent Elizabeth Keen (Megan Boone) tries to keep up, keep Red in check and keeps trying to figure out what connects them. The action is back, the mystery is back, the high stakes are back and Red is back. Although there is gun fire exchange and a lot of killing the action isn’t all guns and explosions. The thrills are also in what characters are going to do and how they are going to get themselves out of situations. “The Blacklist” also manages to place characters in dangerous positions and make you wonder if they’re going to come out alive. Or at least without injury. “The Blacklist” has proved that it cares more about telling a tense story with real dangers than making sure everyone comes home safe and sound. But the real reason, and at times the only reason, to watch “The Blacklist” is Red. Calm, cool, calculating, and deadly, characteristics that Spader portrays perfectly as Red. With Red, bad has never looked so good. Red can shoot someone point-blank without blinking. Then tell a seemingly pointless story that not only has some grand metaphor to the current situation but also gives his character emotion. If you love good villains, high thrills, twist-and-turns mystery, death and destruction “The Blacklist” is one to put on your TV must watch list. “The Blacklist” is on at 9 p.m. Thursdays on NBC or watch online at nbc.com, hulu and catch season one on Netflix. 360 Quiz: Which sitcom couple are you? With Valentine’s Day nigh, take our quiz and find out which small-screen pairing you and your honey most resemble.